That's my dad. He was a male model and a magician for many years. One day he gave Steve Martin his old "Arrow Through The Head" trick. Steve fell down laughing. The next thing you know, Steve is on Saturday Night Live! Dad always got a big kick out of that, but he got a bigger kick out of wearing his crocheted Tweed Jacket! SIZES: Directions for medium size (38-40). Changes for large size (42-44) are in parentheses. Body Chest Size: 38"-40" (42"-44"). Blocked Chest Size (closed): 43" (48"). 40 oz. main color (MC); 7 oz. con­trasting color (CC). Six large and six small but­tons. GAUGE: 5 pats or joint sc = 2". 4 rows= 1". PATTERN: Row 1 (wrong side): Sc in 2nd ch from hook and in each ch across. Ch 2, turn. Row 2: Sk first sc, yo hook, draw up a Loop in next sc, yo and through 3 Loops, ch 1, * draw up a Loop in last sc worked in, sk next sc, draw up a Loop in next sc, yo and through 3 Loops, ch 1 (joint sc or 1 pat made), repeat from * across, end last repeat ch 2, turn. Row 3: Yo hook, draw up a Loop in ch-1 sp between first and 2nd pats, yo and through 3 Loops, ch 1, * draw up a Loop in sp just worked in, draw up a Loop in next sp, yo and through all 3 Loops on hook, ch 1 (joint sc over joint sc made). Repeat from * across, working under turning ch to com­plete last joint sc. Ch 2, turn. Repeat row 3 for pat. To Bind Off: At beg of row, sl st loosely across specified number of pats, ch 2; at end of row, leave speci­fied number of pats unworked. To Dec 1 Pat: At beg of row, sl st loosely across one pat; at end of row, leave one pat unworked. draw up a Loop under ch 1 between first and 2nd joint sc, yo hook and through 3 Loops, ch 1; at end of row, yo hook, draw up a Loop in turning ch, yo and through 3 Loops, ch 1. JACKET: BACK: Beg at lower edge, with MC, ch 121 (133) to measure 25" (27"). Work in pat on 60 (66) joint sc for 6", end wrong side. Check gauge; piece should measure 24" (26") wide. Shape Slits: Bind off (see To Bind Off) 3 pats each side of next row — 54 (60) pats. Work even until piece measures 19" from start or desired length to underarm, end wrong side. Shape Armholes: Bind off 2 (3) pats each side of next row. Dec 1 pat (see To Dec 1 Pat) each side every other row 4 (5) times — 42 (44) pats. Work even until armholes measure 9 1/2" (10 ") above first row of armhole shaping. Ch 1, turn. Shape Shoulders: Bind off 7 pats each side of next 2 rows—14 (16) pats. End off. RIGHT FRONT: Beg at lower edge, with MC, ch 81 (91) to mea­sure 16" (18"). Work in pat on 40 (45) joint sc until piece measures 17" from start, end wrong side. Shape Neck and Armhole: Dec 1 pat at beg of next row (center edge), then every other row 17 (20) times more; at the same time, when piece measures 19" from start, bind off 3 (4) pats at arm side once, then dec 1 pat at arm side every other row 5 (6) times— 14 pats. Work even until armhole measures 91/i" (10") above first row of armhole shaping. Shape Shoulder: Bind off 7 pats at arm side of next row — 7 pats re­main. End off. buttonhole as before, work in pat across. Next Row: Work in pat across, making joint sc over buttonhole ch. LEFT FRONT: Work as for right front, forming double buttonholes (see Double Buttonholes) when piece measures 6" from start, then every 5" twice (3 sets of double button­holes). Continue to work to corre­spond with right front, beg front decs on same edge as first button­hole, reversing shapings (arm side is at beg, center edge is at end of right side rows). LEFT SLEEVE: Outer Sleeve: Beg at lower edge, with MC, ch 37. Work in pat on 18 pats, inc 1 pat (see To Inc 1 Pat) at inner edge (beg of right side rows) every 2" twice — 20 pats. Work even until piece mea­sures 5" from start, end right side. End off. Inner Sleeve: Work same as for outer sleeve, reversing shaping (inner edge is at end of right side rows), end right side. Ch 2, turn. 18 1/2" (19 1/2") from start or desired length to underarm, end wrong side. Shape Cap: Bind off 2 (3) pats each side of next row. Dec 1 pat each side every other row 9 (10) times - 25 (23) pats. End off. RIGHT SLEEVE: Inner Sleeve: Work same as for left outer sleeve. End off. . Outer Sleeve: Work same as for left inner sleeve; do not end off. Ch l.turn. Joining Row: Work same as for left sleeve. Complete same as for left sleeve. FINISHING: Block pieces. With backstitch, sew shoulder seams; sew in sleeves. Sew side and sleeve seams, leaving side slits open. Edging: From right side, with MC, work 1 row sc on each side of sleeve opening. From right side, with CC, work pat row 2 around entire sleeve edge, working 2 pats in each corner. Lap inner sleeve over outer sleeve; sew top of overlap with invisible sts. Sew three small buttons to each sleeve, sewing through inner and outer sleeve. Join MC at right lower front edge. Work 1 row sc up right front edge, across neck edge, and down left front edge, being careful to keep work flat. From right side, work 1 row sc on each side of each side slit. Join CC at upper edge of back left side slit. From right side, work pat row 2 across left slit, back, right slit. End off. Join CC at upper edge of front right side slit. From right side, work pat row 2 around entire front edge, working 2 pats in each corner, end upper edge of front left side slit. End off. Sew top of back slit over front with invisible sts. Work button­hole st around each buttonhole. Sew buttons on right front under button­holes. Steam-press seams and edges. Not affiliated with Coats and Clark. Here is a crocheted jacket worked in the fascinating zig-zag stitch. Make it in the White, Brown and Gold color and be a kitty cat or tiger for Halloween! SIZES: Misses' small (medium-large). Garment width around underarms about 36" (38"-40"). MATERIALS: Knitting worsted, 16 (17-18) ozs. each of Colors A, B and C. Crochet hook slze I/5.5mm or slze required to crochet to gauge. 5 buttons. GAUGE: 5 sc and 5 rows = 2". STRIPE PATTERN: 3 rows A; 3 rows B; 3 rows C. Repeat these 9 rows for pat. NOTE: Use 2 strands of yarn through­out. Crochet loosely. BACK: Row 1: With (double strand)A, ch 66 (70-74) for lower edge, 1 sc in 2nd ch from hook and each of next 6 (8-10) ch, * draw up a loop in next st, skip next st, draw up a loop in next ch, yo and through 3 loops on hook—point dec, sc in each of next 6 ch, (1 sc, ch 1, 1 sc) in next ch —point inc, sc in each of next 6 ch; repeat from * twice more, point dec, sc in each of last 7 (9-11) ch—65 (69-73) sts. Row 2: Ch 1, turn; 2 sc in first sc, 1 sc in each of next 5 (7-9) sc, * point dec, 1 sc in each of next 6 sc, point inc in ch-1, 1 sc in each of next 6 sc; repeat from * twice more, point dec, 1 sc in each of next 5 (7-9) sc, 2 sc in last sc. Repeat row 2, working in stripe pat. When 7" from beg measured along side edge, inc 1 sc each edge once. Continue in pat until 17" from beg. Shape Armholes: Ch 1, turn; sl st in each of first 6 (8-10) sts, point dec, con­tinue across in pat to within last 6 (8-10) sts. Next Row: Ch 1, turn; skip first st, sc in each of next 6 sc, work in pat to within last 2 sc, skip next sc, sc in last sc. Continuing in pat, repeat last row until armholes measure 6" (614 "-7") along side edge. Fasten off. Row 1: With A, ch 35 (37-39); 1 sc in 2nd ch from hook and each of next 7 (9-11) ch, point dec, 1 sc in each of next 6 ch, point inc, 1 sc in each of next 6 ch, point dec, 1 sc in each of last 7 ch. Row 2: Ch 1, turn; 2 sc in first sc, 1 sc in each of next 5 sc, point dec, 1 sc in each of next 6 sc, point inc, 1 sc in each of next 6 sc, point dec, 1 sc in each -sc to within last sc, 2 sc in last sc. Row 3: Ch 1, turn; 2 sc in first sc, 1 sc in each of next 6 (8-10) sc, point dec, sc in each of next 6 sc, point inc, sc in each of next 6 sc, point dec, sc in each sc to last sc, 2 sc in last sc. Repeat rows 2 and 3, working in stripe pat. When 7" from beg, inc 1 st at slde edge. Continue in pat until same length as back to underarm, end with same row of same stripe as on back. Shape Armhole: SL st across 7 (9-11) sc at side edge on next row. Working armhole edge same as on back, work 1 row even. Shape Neck: SL st across 7 sts at front edge in next row. Next Row: Ch 1, turn; skip first st, sc in each of next 6 sc, point inc, sc in each of next 5 sc, skip next st, sc in last st. Repeat last row, continuing in stripe pat until armhole is same length as back, end with same row of same stripe. RIGHT FRONT: Work same as left front, reversing shaping. Row 1: With A, ch 52 (52-52); 1 sc in 2nd ch from hook and each of next 5 ch, point inc, 1 sc in each of next 6 ch, point dec, 1 sc in each of next 9 ch, point inc, 1 sc in each of next 9 ch, point dec, 1 sc in each of next 6 ch, point inc, 1 sc in each of last 6 ch. Row 2: Ch 1, turn; skip first sc, 1 sc in each of next 6 sc, point inc, sc in each of next 6 sc, point dec, sc in each of next 9 sc, point inc, sc in each of next 9 sc, point dec, sc in each of next 6 sc, point inc, sc in each of next 5 sc, skip next sc, sc in last sc. Repeat row 2 working stripe pat. Work even until 17" from beg, end with same row of same stripe as back at underarm. Work 6 rows—2 stripes more. Shape Cap: Row 1: Ch 1, turn; sl st in each of first 7 sc, 1 sc in point, work in pat to within last 7 sc, end 1 sc in point. Row 2: Turn; sl st in first sc, sc in each of next 5 sc, point dec, work across in pat, end with sl st in last sc. Row 3: Turn; skip sl st, sl st in each of first 2 sc, sc in each of next 2 sc, point dec, work in pat to last 4 sc, sc in each of next 2 sc, sl st in last 2 sc. Row 4: Turn; skip 2 sl sts, sl st in next 2 sc, skip next st, sl st in next st, sc in each of next 9 sc, point inc, sc in each of next 9 sc, sl st in next sc, skip next st, sl st in next sc. I sl st in next 2 sc, sc in each of next 7 sc, point inc, sc in each of next 7 sc, sl st in next 2 sc. Fasten off. FINISHING: Sew side seams, sew top of corresponding points of front and back tog at shoulder (point at center back remains free). Sew sleeve seams from lower edge up to the last 6 rows before cap shaping. Sew in sleeve, fitting top point of sleeve between shoulder points and 6 rows at underarm into arm-hole shaping. Edging: Right slde facing, beg at lower right front edge, with C, holding to slze, sc to neck shaping, sc in next 5 sts, work a point dec, continue around to lower left front edge in this manner, working point decs at shoulder joinings, lower points on back and at neck shap­ing, work a sl st in top of center back point. Work 2nd row in same manner. Mark position of 5 buttonholes evenly spaced on right front, having top one just below neck shaping. Work 2 rows more as for first row, working button­holes in next row as follows; * sc to marker, ch 2, skip 2 sc; repeat from * 4 times more. In last row work 2 sc in each ch-2 loop. Fasten off. Sew on but­tons. Steam lightly. 50 Crochet Blocks In A Box! I soooooo happy when I got this fabulous box of blocks! 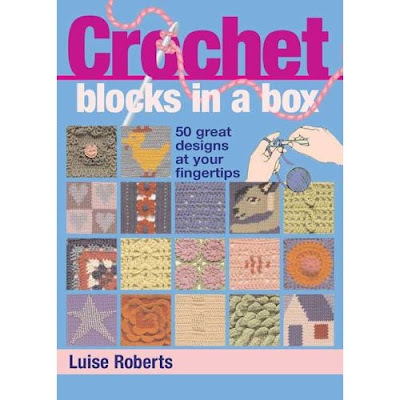 Like playing with an oversized deck of flash cards, Crochet Blocks In A Box, by Luise Roberts.will fill a rainy Saturday afternoon with lots of fun. Printed on a heavy, plastic coated cardstock, the front of each card has a high resolution close-up of the block and the reverse side has the instructions plus variations if applicable. Also included in the box is a small digest subtitled 50 Great Designs At Your Fingertips. Lots of useful information in this booklet on how to put blocks together, stitches, colorwheel, sources and plenty more info. You'll find filet, embellished, tapestry, units, textured, sampler, and lots more that will interest you. Make sure you ask Santa for it. Alert the Media! Step-Mother-In-Law approves!!! I never know what to get my step-mother-in-law for a gift. She’s so very picky. Last Christmas I bought her a chair. It just sits in the corner unused. She refuses to plug it in! Materials: Red Heart Super Saver knitting worsted weight(#4) yarn in either 7 oz solid or 5 oz. multi, color of your choice: Small=18 oz., Med.= 21 oz., Large = 24 oz. Yarn markers: these can be safety pins, bobby pins, commercial yarn markers or just short lengths of contrasting colored yarn. Note: Directions are for small size with med and large in parentheses. 23 (25, 27) inches. Sc in 2nd ch from hook, sc in each ch across. 91(100,109) sc. Ch 1, turn. Rows 2 and 3; Sc in each sc across. Ch 1, turn. Rows 4 and 5; Sc in back loop only of each sc across. Ch 1, turn. Mark each increase with a yarn marker. Rows 7, 8 and 9: Repeat 3rd, 4th and 5th rows. Row 10: Having increases fall directly over the 10 markers on previous inc row, work sc in each sc, increasing 10 sc evenly spaced across. Ch 1, turn. Repeat (3rd, 4th, 5th and 10th rows 15 (16, 17) times more-261 (280, 299) sc on last increase row. Repeat 3rd, 4th, 5th and 2nd rows (This is the Pattern) until total length is 17 (18, 19) inches. 3 sc in first ch, ** draw up a loop in each of next 2 ch, yarn over and draw through all 3 loops on hook. Repeat from ** across neck edge, ending with 3 sc in corner st; work along 2nd front edge to correspond with op­posite edge, ending with 3 sc in end of last row. Rnd 1: Sc in first sc on lower edge, ch 5, * skip next 2 sc, sc in next sc, Ch 5. Repeat from * all around outer edge. Do not join rnds. Rnds 2 and 3: * Ch 5, sc in next loop. Repeat from * around. At end of 3rd round. Fasten off. Attach yarn to first corner loop at neck edge, ch 1, sc in same place, * ch 5, sc in next loop. Repeat from * across to opposite coiner of neck edge. Fasten off. Run ribbon through first row of loops along neck edge. Fasten neck edge at base of edging with a snap fastener. Having 2 inches free between fasteners, sew on 2 more fasteners alone front edges below the first. I had a Capuchin monkey as pet when I was a child. This is the monkey that you typically see with the old timey Italian Organ Grinders. His name was Shem and he was retired from show business. For an old guy, he still had his antics and would show-off if he felt like it. Later on in my life, I worked in an animal lab and made friends with a science monkey. When I joined the circus, more monkeys! Now stop monkeying around and go make this Monkey Brain Hat! Or other highly contrasting colors of your choice. 2nd Round: Ch 3 (counts as 1 d c), * 2 d c in next d c, 1 d c in next d c, repeat from * all around end­ing with 2 d c in last st, join in 3rd st of ch. 3rd Round: Work in same manner as 2nd round but ending with 1 dc in last st, join in 3rd st of ch. 4th Round: Ch 3, * 2 d c in next d c, 1 d c in each of the next 2 d c, repeat from * all around, join in 3rd st of ch. 5th Round: Ch 3, 1 d c in each d c, join in 3rd st of ch. 6th Round: Ch 3, * 2 d c in next d c, 1 d c in each of the next 3 d c, repeat from * all around, join in 3rd st of ch. 7th, 8th, 9th, 10th and 11th Rounds: Same as 5th round, cut yarn. TRIM: Measure and cut the White Yarn into 1 ½ yard lengths, tie securely at one end. ( Use a rubber band to help you.) Divide into three parts and braid the entire length, tie securely. Sew to hat as illustrated with matching thread. I’m a huge fan of the film noir, those dark, moody, crime dramas, late late shows with names like The Devil Is A Woman and Diabolique. Filled with moral ambiguity and sexual motivation, the female lead is always a femme fatale and she’s usually wearing a hat like this! 1 1/2 yards of black ribbon, 1 inch wide. GAUGE: 3 sts = 1 inch; 2 rnds = 1 inch. 1st rnd:. Hold 2 strands of yarn together and work as one. Starting at center, ch 5. Join with sl st to form ring. 2nd rnd: Ch 3, dc in joining, yarn over hook, from front of work insert hook under bar of next dc , draw up a loop and complete a dc—front post dc made; * 2 dc in next dc, make a front post dc around bar of next dc. Repeat from * around. Join to top of ch-3—24 sts, counting the ch-3 as one st.
3rd rnd: Ch 2, yarn over hook, from back of work insert hook under bar of next dc and draw up a loop and complete a dc—back post dc made; make another back post dc around bar of same dc just used, 2 front post dc around bar of next raised dc, * back post dc around bar of next dc, 2 back post dc around bar of next dc, 2 front post dc around bar of next raised dc. Repeat from * around. Join to top of ch-2—40 sts, counting the ch-2 as one st. Always count the ch-2 as one st.
4th rnd: Ch 2, * 2 front post dc around bar of next back post dc, back post dc around bar of next st, front post dc around bar of each of next 2 sts. back post dc around bar of next st. Repeat from * around, omitting last back post dc on last repeat. Join—48 sts. 5th rnd: Ch 2, back post dc around starting ch-2 of last rnd, * front post dc around bar of next 2 sts, 2 back post dc around bar of next st. Repeat from * around, ending with front post dc around 2 sts. Join—64 sts. * ch 1, front post dc around bar of next 2 sts, ch 1, back post dc around bar of next 2 sts. Repeat from * around, ending with ch 1, front post dc around bar of last 2 sts, ch 1. Join. 17th and 18th rnds: Ch 1, sc in joining, sc in each sc around. Join. At end of last rnd ch 3, turn. 1st rnd: With wrong side facing, skip joining, dc in next 14 sc, * 2 dc in next sc, dc in next 15 sc. Repeat from * around, ending with 1 dc in same sc as joining. Join to top of ch-3—68 dc. 2nd and 3rd rnds: Repeat 6th rnd of Crown. 1st row: Skip joining, sc in next st, * ch 1, front raised dc around bar of next 2 front raised dc, ch 1, back raised dc around bar of next 2 back raised dc. Repeat from * 8 times more; ch 1, sc in next raised dc, sl st in next st. Break off and fasten. Do not turn. 2nd row: Attach yarn to first sc of first row, ch 1, working through bock loop only of sts, sc in each st across first row, including all ch sts, ending with sl st in next raised dc on 3rd rnd of brim. Break off and fasten. 3rd row: Attach yarn to first st of first row; turn, working through back loop only of sts, sc in each of remaining sts on 3rd rnd of brim, including all ch sts; sl st in end st of 2nd row. Break off and fasten. Stretch outer edge of brim. Place ribbon around base of crown, adjusting to desired head size; tie ends into a bow at center of narrow section of brim. Turn up shaped section. Remind yourself of that important appointment with these oversized clocks! It would be fun to mark a special time in one’s life with a one of these tickers. And the best part??? No Alarm!!!! NOTE: Crochet firmly to get a heavy holder for maximum protection. Materials: Elmore-Pisgah Peaches & Crème 4 ply cotton yarn balls in 2 colors of choice per potholder. Highly contrasting color combinations work best, like black and white or brown and gold. Gauge: Diameter should be 5 1/2 to 6 inches. Mark first stitch of each round. Row 2: 9 sc in ring. Do not join rows but continue working in a spiral, marking first st of each row to keep your place. Row 3: 2 sc in each st around (20 sc). Row 4: sc in next 2 sc, 2 sc in next sc. Repeat around. Continue working with sc in this manner, increasing when necessary to keep work flat (being careful of over increasing as this will cause work to pucker) until 13 rows have been made. Fasten off. EDGE: Join CC to face in the back loop of st, Sl st in back loop of each st around. Fasten off. Numerals for the clock are crocheted and appliquéd to their proper places (as illustrated). Hands made and appliquéd in same manner. All may be cross-stitch embroidered if desired. For hands, 6 and 8 o'clock, ch 20. Appliqué in place as shown with hands pointing to the hours desired. ch 6 and join to form ring to sew to center of clock over the inner end of hands. Crochet a loop for hanger (or sew a bone ring) behind the 12 on each clock. For a tailored effect and added protection, pad with flannel and line the back with sateen. Pineapples!!! 3 for the price of 1!! !